This post KKR Shares to Triple Over Next 5 Years appeared first on Daily Reckoning. I believe that there is a very realistic chance that the shares of alternative asset manager KKR & Co. can triple over the next five years. I also believe that there is very little downside risk from buying those shares today. This makes KKR & Co. the kind of low risk, high reward investment opportunity that we are always searching for but don't often find. Let me explain this compelling opportunity further by answering four key questions? Question #1: What Does KKR Do? KKR was founded 42 years ago as a "one-trick" private equity buyout shop, meaning they buy out other businesses with the hope of turning a profit down the line. Over time, KKR has evolved into a more diversified global asset management firm that invests capital across a variety of different alternative asset classes. To be clear, by "alternative asset classes," I mean that KKR manages hedge funds, credit funds, private equity, infrastructure and real estate funds. These funds cater to institutional and very high net worth investors. Through a management fee that is based on a set percentage of the assets that KKR manages. Through a performance fee that is tied to the rate of return that the funds generate. By investing KKR's own capital beside its clients in the funds that KKR manages. 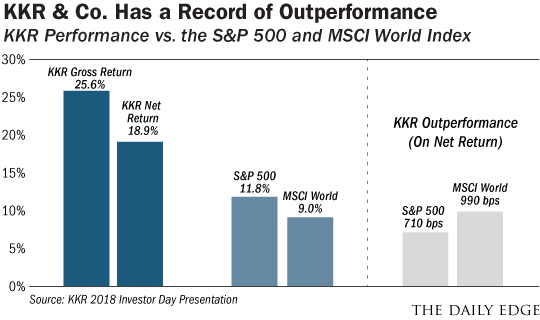 Currently, KKR has almost $190 billion under management across its various funds. Question #2: Is KKR Any Good At What They Do? The answer is a resounding yes! We have more than forty years of data to verify that. From inception in 1976 through the first quarter of 2018 (the last available data), KKR's private equity funds have generated an annualized rate of return of 25.6%. That isn't just good folks, that is great. Over that same time period, the S&P 500 has generated a very solid annualized rate of return of 11.8%? but KKR has more than doubled that before fees! Question #3: Why Do I Think There Is Very Little Downside Risk? KKR's current share price is around $23.50 per share. Meanwhile, sitting on KKR's balance sheet are $17.50 in cash and investments ? investments that are increasing in value every year. Since the cash and investments that KKR owns are worth $17.50, that means that at the current share price of $23.50 we are paying only $23.50 - $17.50 = $6.00 for KKR's asset management business. That $6.00 per share is for an asset management business that earned $1.65 per share in 2016, $1.66 per share in 2017 and $1.93 per share in 2018. That means that today, KKR's asset management business is trading at barely more than 3 times earnings. That is the kind of valuation that you would normally see on an operation that is in terminal decline. And I can assure you that the future of KKR's alternative asset business is most definitely not that. Question #4: How Do KKR Shares Triple From Here? 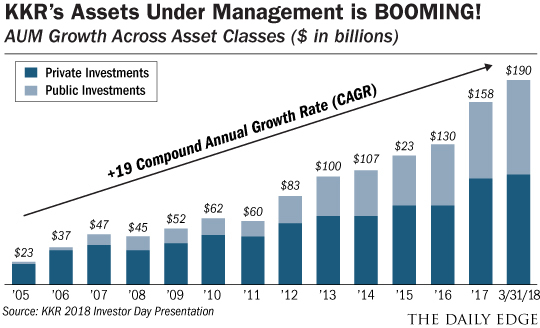 With over $190 billion in total assets under management, KKR looks like an investment management juggernaut. It certainly is that, but the size of the company actually pales in comparison to much of the competition in this industry. Globally, KKR today is just the 103rd largest asset manager.1 KKR's $190 billion of assets under management are less than 3% of the assets under management of Blackstone, the largest firm. My point is that KKR has lots of room to grow, which is exactly what KKR has been doing at a very rapid clip. Since 2005, KKR's assets under management have increased at an annualized rate of 19 percent! With KKR having laid the foundation to launch new investment products in real estate, technology, health care and lending, I believe that this rapid rate of growth is sustainable for the foreseeable future. With a growth rate of near 20 percent and the likelihood of the market increasing its valuation of the KKR business from a measly 3 times earnings, I believe there is a very real chance of KKR's shares tripling in five years. That is a very tantalizing proposition, especially when you factor in the terrific record of outperformance and downside protection that $17.50 per share of cash and investments provide! The post KKR Shares to Triple Over Next 5 Years appeared first on Daily Reckoning.